Chana Dal is rich in carbohydrates and also contains a good amount of protein content. There are various other essential micronutrients that it contains and it is considered quite healthy. The number of calories and nutritional value in its raw form is different from that in its cooked form. One tablespoon of raw chana daal weighing around 12.50 grams contains a total of 46 calories out of which 65% of the calories come from carbohydrates, 21% of the calories come from proteins and the remaining 14% calories are obtained from fat. The total carbohydrate content in an equal quantity of raw chana dal is 7.58 grams, dietary fiber content in it is 2.2 grams and protein content is 2.41 grams. 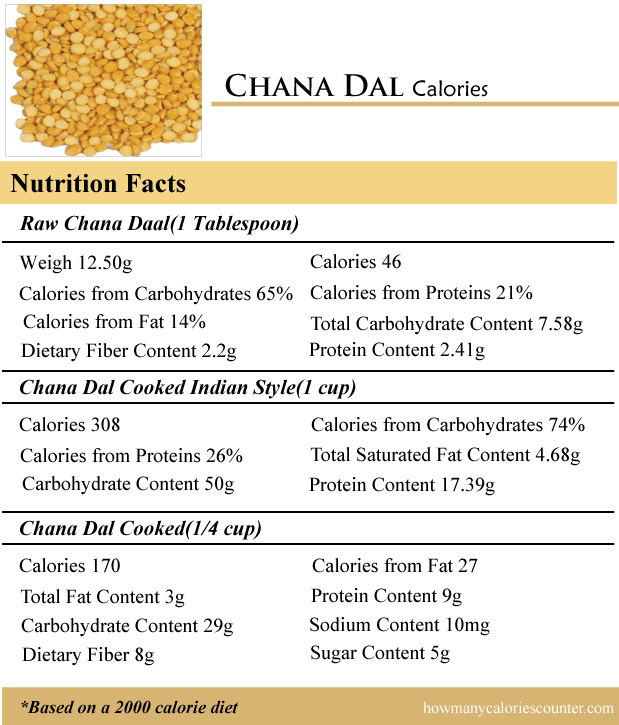 One cup of chana dal cooked in Indian Style contains a total of 308 calories. Out of these 308 calories a total of 74% calories are obtained from carbohydrates and the remaining 26% calories come from proteins. The total saturated fat content in an equal serving of similarly cooked Chana Dal is 4.68 grams, carbohydrate content in it is 50 grams and protein content is 17.39 grams. You may cook chana dal using different recipes. One fourth cup of chana dal cooked using another recipe, adding more tasteful spices contains a total of 170 calories out of which 27 calories are obtained from fat. The total fat content in an equal serving of cooked chana dal is 3 grams, protein content is 9 grams, carbohydrate content is 29 grams, dietary fiber content is 8 grams, sugar content is 5 grams and sodium content in it is 10 mg. It also contains a good amount of calcium and certain other minerals which are essential for the body. Similarly preparing chana dal using its other recipes would change its number of calories and nutritional value to some extent.